Type: Lithium. 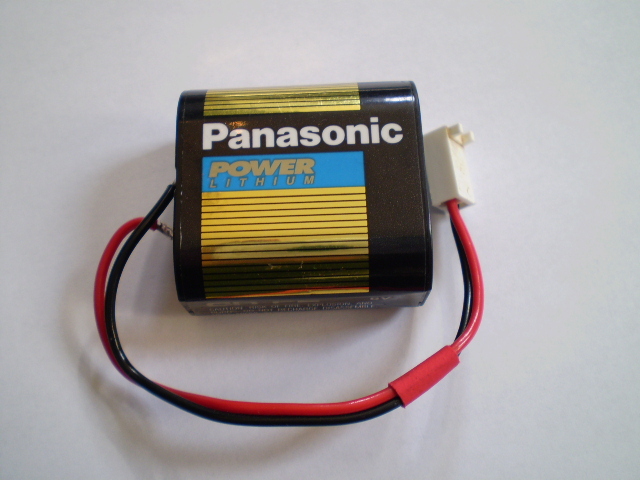 Voltage: 6 V.
Length: 35 mm. Diameter: 19.5 mm. Height: 36 mm. Connector: Molex. Flex: Two wires 12 cm long. Price: £14.00 each. £12.00 each if you buy two or more. Postage and packing included. Also known as: CRP2P, DL223A, CR-P2, K223LA, EL223AP, PC223, 5024LC, CR17-33, CRP2S, PC223A, VL223. This CRP2 with lead and connector is used for battery powered surface mounted urinal flushing control sensors. The CRP2 lithium batteries it is built from offers high capacity for a long battery life and high current drain capability. This CRP2 with lead and connector urinal controller battery is suitable for use in several units including Hydrocell & Aquamate urinal and Leaklock isolator controls. This CRP2 with lead and connector has a shelf life of up to ten years. Why not buy several, take advantage of our reduced price and make sure you are not left without an automatically flushing urinal the next time your battery runs out.